This is my beautiful visitor, a Northern Flicker. 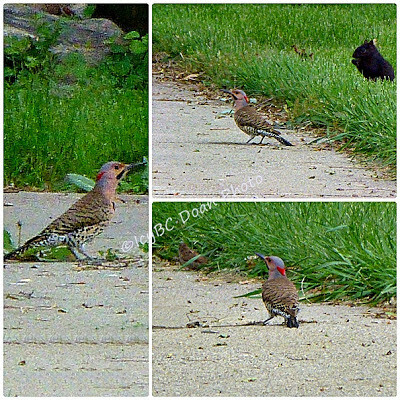 It has been a frequent guest in my neighborhood looking for insects between the cracks in the concrete slaps. This handsome bird is quite shy; one tiny little noise stirs and he will take off. His eyes are always on alert. He has been around every other day, visiting different driveway and very busy pecking down into the crack. Do you see how deep is beak down in the dirt? He is very determined and very furious with his work too. Have a wonderful week.. I've never heard of this bird before. What a beauty. He must have found some great bugs down in the cracks. Nice sighting and photos. Beautiful photos, you have cool guests in your neighborhood. What a handsome bird. Nice shots. Icy, he is beautiful and what a treat to have him as your visitor. Beautiful shots.